Between making your list and checking it twice, December is a busy month. Even if you enjoy shopping for Christmas presents, it can be hard to find something for everyone in time for the big day, including yourself! Instead of letting your tinsel get in a tangle, let us help you cross someone extra nice off the list with our Holiday Giveaway! Three (3) lucky winners will win a $75 Gift Card PLUS free Service Fee to Teleflora.com to be used on a Christmas flower arrangement or Christmas Centerpiece! What better way to deck the halls and bring in good tidings of joy than with a beautiful display of holiday colors and scents? How Do You Win the Holiday Giveaway? Our holiday campaign, You, Delivered by Teleflora, celebrates the memories you’ve created during the holiday season and brings you right back into the middle of it all if you are unable to get back for the main event. So this year, enter by commenting below and telling us what you have done for someone in the past when you couldn’t spend the holidays with them. Write a comment (below) on this blog post telling us what you have done for someone in the past when you couldn’t spend the holidays with them to complete your entry. Where do you do that? Scroll down this page to the comments section to add your comment. The three (3) random winners will receive an email on December 14th! So please use a valid email address and name when adding your comment. NOTE: SPAM BLOCKER TIP: Please be sure that when you check your email inbox on 12/14 that you also check your junk and spam folder for an email from Teleflora.com. You must purchase flowers from one of our Christmas Flowers or Christmas Centerpieces pages by December 24th. You can order flowers for yourself or someone else. Your centerpiece will always be hand-delivered by a local florist. Cannot be combined with any other promotional offer or coupon. Be sure to place your order for your Christmas flower arrangement in time for the holidays! Thank you to everyone who entered! This contest is now closed. I make candy most every year and my step son loves my Needhams, he lives in California & we live in Maine, I’ve packed some up and sent them at Christmas to remind him of home… He loves it and they are made with much Love, your flowers are absolutely gorgeous and they give you such a great feeling, not just when receved, but every time you walk past them,he has sent me flowers at times and it really makes your heart shine, Flowers are the best medicine for anything and whether they are an “I Love you ” or an “im sorry” they just work!!! GREAT idea to brighten your house and bring love, color’s, & wonder to your house for the holiday… We have a big party Christmas Eve every year and I can tell you an arrangement like yours would bring joy to everyone & there wouldn’t be one person who wouldn’t mention them from 4 years old to 74 years old! Thanks for the chance! I usually send a couple people I love in my family flowers since I can’t spend the holidays with them like my grandma and mom back home. I love this Christmas flower arrangement. Very pretty! I like having my house decorated and looking festive when we host our family Christmas party. I would send a gorgeous centerpiece like the one above to make their day!!!! I love this post – and having flowers on the table makes for a great gathering! It’s been too long since we enjoyed a beautiful Teleflora centerpiece! Thank you for the chance! Last Christmas my son was stationed overseas in S. Korea with the U.S. Army. I sent a Christmas care package with all his favorites cookies and goodies that I bake every year. This year he is stationed in Kentucky and we will be spending Christmas in Nashville with him! I love this opportunity to win flowers. I love receiving flowers almost as much as giving them. But to those I can’t see on holidays, I always try and send fresh flowers to let them know we are with them in spirit, and it shows that we care and went a little special to help enjoy the holidays. Every year I send a Christmas center piece to my mother-in-law from my three kids. She lives 840 miles away, so we don’t get to spend Christmas together, but she looks forward to the tradition of receiving the Christmas center piece each year to remind her that we love her and are thinking of her. This is a special way to celebrate Christmas. Several years ago, my dear friend had just lost her mother and the holidays were coming. “Merry Christmas” seemed cruel and harsh that year so I ordered her a Teleflora bouquet. Across 2000 miles she got my message and through tears of loneliness shed tears of joy. Flowers said what I could not say with words! I have always sent a care package to family or friends I could not spend the holidays with. Some baked cookies always seemed to hit the spot. This is Amazon gift. Thanks so much for the chance. Hope I when this would look beautiful on my table for Christmas. I would love a Christmas bouquet for my home!! Flowers have a way of brightening up our hearts and lives. Simple jestures of love. You have wonderful arrangements for all occasions. Sending flowers is the best way to brighten someone’s day. Our friend’s mom was down in the dumps and we sent her a lovely bouquet, no reason just thinking of her. So glad we did as she has now passed away. It made her smile for a long time. I bake cookies & also write a heartfelt card to loved ones I can’t be with for the holidays. If I know that I will not be able to travel for the holidays to visit my family or close friends, I always send them a gift basket of fruit, chocolate, etc or a Christmas Centerpiece for their table with a handwritten card expressing how much I love and miss them. Most of my family live out of state in So. Carolina. I live in NJ. Since we don’t get to see each other during the Holidays, I usually send a photo book of my family, especially my kids. I also usually send some homemade treats for everyone to enjoy. Though we can’t be with them physically, we do call and talk to our family mostly every day. Just an absolutely lovely centerpiece. Would look good in my dining room. When I am unable to spend the holiday with someone I love I am sure to Skype them that day to send good cheer and I make sure I send them a gift. My family is pretty spread out — and there have been times due to illness or bad weather when we couldn’t get together over the years. But luckily Teleflora has come through with last minute gift ideas and delivery in time for Christmas. For that I am thankful. Happy holidays to all! Thanks for the chance – we’re hosting Christmas & this would really brighten up our table!! I would call them on christmas morning. I would like to win this so I can send my wife flowers. I like to FaceTime my loved ones when I can’t be with them during the holidays. Floral arrangements are my way of staying in touch. I like to talk to my family if I can’t be with them for the holidays. sending them flowers would be nice too. I’ve sent flowers and cards and little gifts to my sister and to my mom. They live long distance so that way they know I’m thinking of them and it brightens their day. I’ve done two things..first time is stick a large picture of those people to their “would be” chair at the dinner table. The second thing was to surprise my mom by downloading skype to her laptop and have my brother “sit with us” at the dinner table. I don’t try to out-do anyone and I buy clearance things all year long. I’m always more than half-done with my gift list before the holidays hit. I love the christmas flower arrangements! I like to make sure I send a card with a handwritten note and a small thoughtful gift to let them know I am thinking about them. I also call on Christmas day to send my love. This is amazing! 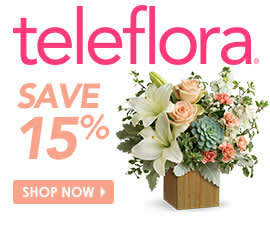 I would love to enjoy Teleflora flowers myself because i always send them to others! Your arrangements are stunning!! What a beautiful center piece for Christmas table or around your home. A real nice jesture from the floral shop. I’m sure alot of people are deserving of this wonderful gift. One year while a patient in the hospital in another state, I couldn’t make it home for Christmas. I did have my laptop with me so I checked online & found our local florists number. I called & arranged for my mom to receive a delivery of a beautiful floral centerpiece and sent a cookie basket for my dad. Every year I either bring or have flowers delivered to my mom and always make cookies for my dad so even though I couldn’t be there in person, I was still able to have the family traditional gifts delivered. The flower arrangement in the picture above the blog post is absolutely beautiful! The flower arrangement in the picture is beautiful! Perfect finish to Christmas decorations- simple and elegant. I think this is a great thing that you are doing. We don’t always get to be with the ones we love at Christmas or other special occasions, but we still miss them so much. Send a card, calling a loved one or sending a beautiful flower arrangement will always put a smile on their face, and teleflora has some very beautiful Christmas flower arrangement. By sending them a special, personal card. Would love to win once! thanks for the chance! I’d love to surprise my sister with Christmas flowers. I send a Christmas Card and recent photos when I can’t see friends and family! Wonderful giveaway! I make presence felt when I can’t see my friends or family during the holidays by sending them a beautiful arrangement and heartfelt enclosure card. Thank you Telefora for this Beautiful Opportunity to Participate in your Giveaway! I will like to have a Lovely Chritmas Arrangement from Teleflora. Simple entry to win some gorgeous flowers! I send Teleflora arrangements to family out of town and they always love them! Sent them some flowers.make them feel better. Flowers have always had a special place in my heart so when there has been an occasion when I have not been able to attend (usual because of distance) I immediately order a beautiful bouquet of flowers. Last year, I was unable to visit my brother and his family who had recently relocated from east to west coast, it only made sense to have an arrangement with my sister in laws favourite seasonal flowers accompanied with a loving note. We have been fortunate that our families live close and we have the opportunity to spend time together. It wasn’t always like this. Many times I’ve wanted to have a little extra time in my day or evening to spend with a friend or relative. I’ve always made sure to call, make some cookies or just stop for a few minutes and bring a small gift or an orchid to brighten their day. With the advancement of the internet and ordering online, I am able to order flowers and have them delivered, arranged and fresh so quickly. Thanks for the opportunity to win these gift cards. Merry Christmas to all of you and your staff. (Now, I’m off to order more flowers for a friend). This would be great to win! My 97 yr old Mother would love to get a bouquet of beautiful flowers. I would surprise them with a bouquet of their favorite flowers, a home made card, and call them whether its on Skype or on the phone. I just want them to know they are loved and cared about even when we are miles apart! If I can’t be there I send a gift basket or arrangement that they can enjoy. We are now able to have facetime talking so we do that to make sure we keep in touch with our loved one.s. When I can’t spend time with my girls at Christmas or any other holiday, I send package with small gifts, chocolate covered strawberries and floral arrangements. Nothing says I love and miss you better then a beautiful floral display! When I can’t be near my loved ones for the holidays, I love to bake or make handcrafted gifts to send ahead of the flowers I send for that special day. We have set up an open Skype link so that is almost like we were all together. My mom loves flowers though, so this would be extra special. When my younger brother & sister were little, my mom was a single parent. She sent me a picture of them sitting next to a branch of a tree that looked like a Charlie Brown tree. I made more than my Mom while I lived in California by 19 than she did supporting two kids in Illinois. I sent home Christmas presents that year including the first Nintendo, clothes for my sister and $ for my Mom. I did that several years in a row. My sister has never forgotten it. Two years ago, I took her & her two kids to Club Med in Punta Cana for a week and when my brother’s marriage was in trouble, I put up the retainer for the attorney until he could repay me and stayed in touch with him everyday because he was very depressed. I would love to give flowers to my sister. She always act like my mother. She is very humble. I love sending Teleflora flowers to my mom usually. She is about 1 1/2 hours from me. Sometimes I buy them and put them in the guestroom at our house when she comes to stay for a week (like this Christmas), but I also sent her some for her birthday in November too, although I saw her. She is 91 years old and still doing very well and I just want her to know how much I love and appreciate her. I face time family and friends when we can’t be together for the holidays, and I also have pictures and ornaments to remind me of special times spent. Went I cannot be near. I send flowers so dear. I then make a call, and stand tall. My family is spread out all over the country so if I can’t be with them I like to send a flower arrangement. The flowers brighten up a room so much. We are away from family often during the holidays. And we always send wrapped gifts or flowers or baskets or e-gift certificates or whatever other present we think they’d like. When I can spend the holidays with a loved one We FaceTime and I send A care package. We are the only ones live out of state and my husbands mother is 92 so we call her every week and try to send her flowers as often as possible, We also on Christmas send her flowers and money. It is hard for her as we live over 1200 miles away and can’t get home often. We just want her to know how much she is loved and thought of !!!! I make phone calls to all those I can not spend time with during the holidays and we chat and chat and pass the phone to others during our celebration!! I have sent my Son an Daughter-in -Law flowers many times. I love the arrangements they send them an so do they. Thanks for all you do. Quality time with someone is one of the most precious experiences for anyone not to miss but it happens. So in the moments that I can not give my presence, I send an handwriting letter sharing my ❤ on why i LOVE them and the value that they bring to my life. I FaceTime with my grandson and his family if I can’t be there in person. I always send teleflora to whom ever is hosting our family Christmas party each year !! I have an aunt who is 81 in Colorado, a single friend who lives a couple of hours away and an elderly couple I love so much. Each Christmas I sent them a plant or some kind of floral arrangement to let them know how much I think of them and miss them. Flowers always bring a smile to everyone’s face and let them know how much you are loved. I have elderly friends and family all over the country. At Christmas I love to send a nice Christmas arrangement to let them know they are loved and missed. It always brings a smile to their faces and brings joy to me. I make my presence felt when you can’t see your friends or family during the holidays by sending them a lovely floral centerpiece for the dinner table! This year my grandmother will be turning 93 and can no longer travel. I sent her a flower arrangement and followed it up with a card that my boys drew. Flowers make everyone smile so when I can’t be there, I want them to know they are loved and cherished. One of my young cousins is in the Army and she hasn’t been able to come home in years. I always send her something from home to make sure she knows she’s thought of, even if she can’t be with us. We are so proud of her! When I wasn’t able to spend Christmas with my grandmother I sent her flowers and video chatted with her. It wasn’t the same as being together but it was better than nothing. Last Christmas my son was stationed overseas in S. Korea with the U.S. Army. It was the first time of not having him home with us at Christmas so I baked all his favorite Christmas cookies and treats and sent them over to him. Looking forward to this year as we will be spending Christmas with him. It’s important to reach out at the holidays, no matter what you are celebrating, to the people that you care about and especially those who you do not see often. Cards & cookies are my favorite ways to keep in touch and express feelings. I send them flowers so that every time they look at them they will think of me since I can’t be there! I send them flowers so that every time they look at them they will think of me! I have sent flowers so that way when they look at them they will think of me! When having family holiday parties and someone far away is unable to attend, we call them and pass the phone around to talk a little and wish them Happy Holidays! WE skype with our Family back in Texas. As our in laws are quite the drive apart, we have to take turns who we spend holidays with. We enjoy a good phone call with the farther away relatives and send a card. My daughter lives in New York havn`t seen her in 6 years, usually send her something to let her know how much she is missed!!! To keep a little love in their hearts, we Skype and also send handmade presents. Last year when we couldn’t spend the Holidays with my daughter we mailed her gifts and some baked treats ahead of time and after dinner the whole family got together to Skype with her while we all opened gifts together. When not together on holidays, I have sent cards, gifts, chatted online or on the phone and of course sent flowers. I always like to acknowledge those I love and can’t be with by sending them a card that talks. I love those Hallmark Cards that you can record a message in and send. It is so personal and thoughtful and a wonderful idea. Flowers are also a terrific way of sending someone some love! I love getting flowers as much as giving them. I always try to send flowers to family members who cannot be with us on the holiday so they know they are thought of and missed. We’ve sent flowers and gift cards in the past when can’t get together. I like to send flowers, a personal note and a nice food treat. I send flowers to my grandma, because I never get to see her on Christmas. I love to send flowers……I know myself that when you receive flowers it lifts your spirits, especially if you haven’t seen the person in a while. Very special!! We have relatives all over the country, USA, and we truly wish we could spend Christmas and the holidays with them all! What we have done for my mother-in-law who lives across the country from us is we send her a beautiful floral arrangement and under separate cover we send her a digital picture frame with dozens of holiday pictures of us all, my husband and children so she can watch it over and over again and feel as tho she was right there with us! Digital picture frames are easy for people to use who are not efficient on the computer or electronic devices and smartphones. That describes a large population of seniors! She is truly touched by this and I know we have made her day! She loves the flowers and is overjoyed with the pictures! If I am not able to spend the holidays with my kids and grandkids, I send them their gifts and add a special floral arrangement for them to enjoy as they think of me each time they look at it. I order gifts online and send them directly to their house, or have them go pick the up at the store after I’ve paid for them. Their gifts are a surprise either way. I also FaceTime my family while they are opening gifts so I can watch and enjoy the moment with them. Centerpieces are a tradition for the Christmas table, When I can’t be home for the holidays I always send a centerpiece. It cheers her up, and really makes a festive mood. I keep in touch by talking on Skype with my family that lives in different provinces. I keep in touch my talking on Skype. I often send care packages of edible goodies to my family when I can’t be with them for Christmas. I send every year to my sister in Florida. It’s our thing.It’s something we enjoy. Love the flowers, love the spirit. Well we love flowers. I lived in Japan for three years and missed the three Christmases and each year I made a video Christmas card to send with a small package of goodies from Japan to my family to enjoy and watch while I was away from them. I send fruit baskets and flowers. When I cannot spend time with loved ones, I call, send a card and gift and sometimes send flowers. When I can not spend time at the Holidays with loved ones, I either call, send a card or gift and sometimes have a floral arrangement delivered so that they know that i care. When I can make it to family Holiday gatherings, i either call, send a card or gift and sometimes a floral arrangement to let them know that i care. I like to send a nice card along with a gift, such as flowers or some photos. Lets people know that you are thinking of them! Send a nice gift package with card and have a beautiful Christmas bouquet delivered. Living apart from my sons and their families is difficult, especially during the holidays when it doesn’t work out for us to all be together. This past Halloween, I sent each family a package of new wool hiking socks, stuffed with Land of Lakes hot cocoa packets. It was fun to receive pictures on my cell phone from each family (parents and kids grouped up on the couch) wearing their new socks, with steamy cups of hot cocoa. My sons live in another state and they are so busy! When babies are born I always send 2 Dozen roses until I can get there. I’m visually impaired so travel is difficult. Same with holidays until I can get there I send flowers! In the past when I was unable to be with loved ones for the holidays I have sent a gift box of homemade goodies from me (holiday cookies, candy, hand mixed cocoa or soup mixes) with homemade cards and some type of homemade gift. The gifts were things like handmade Christmas tree decorations for their tree or hand sewn Christmas stockings stuffed with fun and silly treats for them. We alternate years between visiting my side of the family and my husband’s. This year we visit mine for Christmas so we visited his for Thanksgiving this assures that we get to spend some time with everyone which is important. If I’m not at my parents for Christmas I make sure to send them something special like a gift, flowers or a Christmas treat. I also FaceTime them and send lots of pictures of the kids. I do the same for my mother in law it means a lot to her because ours are her only grandkids. We are a military family & have been away for 8 years. So I would send my parents flowers (along with gifts). We are finally home for good to actually be with family this year. My Mom will still get flowers but flowers will go on my Dads grave. We lost him this year. My brother lives in Wisconsin and I miss his so much, last year I sent him a box with all our childhood favorites. Snacks, movies and gumby toy that was his favorite. When I can’t be with my mom on a holiday or special occasion, I always send her flowers so she knows I’m thinking about her. I sent them a Christmas card sharing my feelings in it. I send flowers or a fun gift basket to relatives that are far away. Such a easy and appreciated gift! When my son was sent off to war unexpectedly at a very young age, I set off to uplift these brave individuals by making a difference in their lives, their family lives and their local and worldwide recognition. Started small with getting neighborhood active in getting care packages ready for them; then town…towns active in donations of all kinds; got with military Moms and put Christmas picture ornaments up of our loved ones’ far away military faces on a large Christmas tree at the local zoo with families (including the kids); then penned several poems from the heart that went viral. . one lyrical poem featured first page along with dedication on an old world gold velum anthology by a publisher out of the poetry capital of the world…London, England!,,,this particular poem honors all our brave worldwide. Went to battle a local university and got all tuition/board fees dropped for those that were called up by the military (previously, the university was billing them, even though they had no choice to go to war); was instrumental in getting all the soldiers that came home from the war that year my son came home to being declared ‘Citizens of the Year’ in their local town….along with local businesses and homeowners’ marquees welcoming many of them home by name! I reminisce about going all out when my young son was called up to duty in the military and wasn’t even allowed to take mid-terms at his university for it was the largest call-up of the Guard. I started locally organizing neighbors, then businesses, military moms, military events to aid all those brave. Care packages (small and large) were on the move; heavy donations pouring in; the military assisting in getting perishable food items shipped to our loved ones on time before items going stale; presents/cards sent for holidays/special occasions; phone cards sent to allow them to call home; movement evolved to get them from outside awful conditions….tents to trailers…with carpeting, supplies, health items, etc., cards/presents full of well wishes from zillions were off; local town made them ‘Citizens of the Year’ upon their return with worthy plaques and promos; businesses/homeowner associations welcomed them home ….sometimes personally with giant marquees; I wrote poems, one lyrical poem celebrates our brave worldwide and honors them….featured by a renown publisher from the poetry capital of the world ‘England’ on page 1 of and old world gold velum poetry anthology. I have many of my relatives that live in different states. So I send them money so they can buy what they truly need. I never get to spend Christmas with my Granny so I always send her a beautiful arrangement from Teleflora. It makes her day and mine when she calls to tell me how happy she is when she receives it! I always send Christmas cards, no matter how broke I might be. I just want my friends and family to know I am thinking about them! I always send cards, no matter how broke I might be. I want my family and friends to know I am thinking about them. Anything that reminds them off home is what I send. Their favorite cookies, some family photos and a handwritten note of how they are missed! In addition to mailing something (card of a present) ahead of time, I called on the holiday. There’s nothing like a personal conversation. I always sent pictures of my kids to my parents. We were able to see each other a couple times a year as the kids were growing up, but we weren’t always able to spend the holidays together. I sent a gift box of breakfast foods and phoned on Christmas day. The last gift I sent was beautiful tulips at Easter to my husband’s Grandmother. Her Kate husband was Dutch so I knew they’d be perfect. She said she never received so many flowers before! I like to send flowers and some baked goods for Christmas if I can’t see them in person! Long distances between family is always hard for the holidays. I made my parent’s holidays sweeter by sending gifts through a delivery service. I love being able to order online or by phone to send gifts! I usually send cards & order some kind of brownie/cookie/pastry tray for the families that I cannot be with, during the holidays. A flower centerpiece would be wonderful. Thank you for the opportunity! The 26 years my husband spent in the military, we were only able to make it “home” less than half the time. We were thrilled when Skype came around to we could be there even when we couldn’t be there. I was unable to see my aunt and uncle last year. I sent them a bottle of their favorite wine, some delicious treats you can only get locally, and a huge bouquet of my aunt’s favorite flowers! They where so happy to get the goodies, and I was happy I could brighten their day and show them my love- even from far away! I make home made jelly,so when X-Mas comes around I’ll go visit my relatives and give out some samples! Homemade goodies for neighbors and friends are our tradition. The best memories are made! My Mom died on 12/15/2006 so every year on that date I donate a poinsetta plant to the nurses station at the Hospice facility she was at. Love this blog! I always send flower’s or giftcards to them. But I will try everything I can to makesure our family can be together for Christmas! I have sent homemade cookies and a card or letter. I usually send a video tape of my family wishing them a Merry Christmas. I also send a care package if I can. I have often sent a flower arrangement when I could not been there in person. never shows your love better then sending them some teleflora flowers. With so many to choose from you will always pick the right 1 n put a smile on that special person face. Plus the flowers do last longer then any other.. thanks for the chance. Last year when I couldn’t make it home for the holidays, I sent my Mom a beautiful flower arrangement with candles that she used as a centerpiece for her Christmas table. Mom truly loved it and still talks about how gorgeous it was! If I can’t visit with family during the holidays, I usually send a gift, a bouquet of flowers, and always call. I send a box! I like to fill it with something they can wear, read, want and something to eat! I made a photo collage and scrapbook of our best times together. I have also paid for dinner. I’ve sent Christmas presents and cards and given them a phone call when I could not be there in person. I’ve sent flowers and cookies when I wasn’t able to be with loved ones during the holidays. Nine years ago, Jane came into my life when she joined my quilting group. She never had a daughter…..she has 2 sons and one of them died unexpectedly last year. That has changed her life. We have become close and she’s my “mother”. Your beautiful bouquet would make this special lady know just how much she is loved. We send homemade cookies and presents to family that we can’t be with and it would be awesome to send Teleflora! I have relatives in Germany. I love to pm them as much as possible! This giveaway would be an awesome gift for the holidays! Ty for the chance to win this giveaway,! Ordered my Christmas flowers today! iI do not have family near now for the last few years. It gets sad and lonely, but then I bake, and bake, and bake. Then I wrap, and wrap ,and wrap ALLL THE GOODIES. I usually mail them out on 15th so it is received b/4 Christmas. Doing this makes me feel like when they are enjoying their treats, a little of me is there with them. That is a blessing for me. This contest is now closed! Thank you to everyone for sharing your wonderful holiday traditions. Happy Holidays!